Server market growth continues, despite the misleading statistics. This is the time of year when reports get issued summarizing the sales results of the server market in the first quarter. As a way of grabbing attention, many of the headlines will mention that the results of the first quarter are below those of the fourth quarter, bringing to mind all sorts of doomsday scenarios. In many industries, sales exhibit a large seasonal component. Seasonality is easy to imagine in the consumer industry, as many items are purchased during the end of the year buying spree, with the first quarter of the following year being sequentially down, a sort of natural rest period. Retailers do what they can to smooth their results, which include having promotional sales for other holidays like the Lunar New Year or U.S. President’s day. What most people don’t realize is that even sales of enterprise equipment, like servers, demonstrate some seasonality traits. One of the theories about why this happens explores the idea that most companies have a fiscal year that correlates with the calendar year, and therefore they may have “use or lose” budget. However, analyzing some historical data might give us better clues about the seasonality traits in the enterprise market. 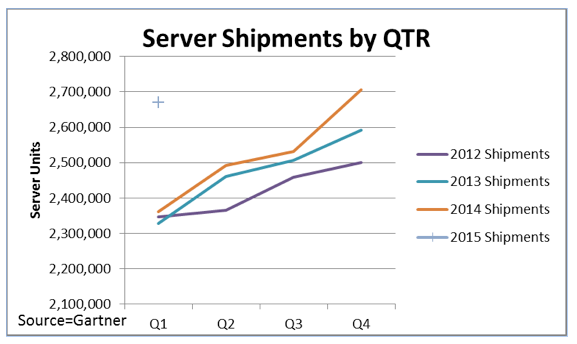 Below is a chart of Server Shipments by quarter with each year denoted by a different color line. While the slope of the lines is exaggerated due to the scaling of the Y-axis, it is quite easy to see that, by and large, server shipments increase throughout the year. And then shipments drop off dramatically (usually) when comparing Q1 of any year to Q4 of the previous year (e.g. Q4 2012 -purple line- had 2.5M shipments. Q1 2013 -blue line- had 2.33M shipments). Now take a look at the data-point for Q1 2015 (the + sign). Like all the other shown years, Q1 2015 shipments were sequentially down from Q4 2014. But, when looking at the data as graphed, that news doesn’t appear to be bleak. In fact, Q1 server shipments are very near all-time highs. Without knowing anything about the economy or what’s driving the market for servers, would you hazard to guess what the full year 2015 shipments will look like? The growth in data analytics and the need for more compute performance will continue driving the demands for greater server capacity. Associated with the growth in the server market is even greater demand for memory — and lots of it. For example, a high-end server can have 48 or more DIMM slots, providing nearly 200x the memory capacity as a standard PC. A server not only requires more memory, but also higher bandwidth memory. The industry is currently transitioning to DDR4 memory, which will eventually lead to speeds that are 50% higher than the older, DDR3 memory, and with improved power efficiency. The explosion of information being generated and processed in Big Data applications, like real-time analytics, virtualization and in-memory databases, is staggering and it has only just begun. These massive amounts of data will continue to put pressure on data center and enterprise servers for more bandwidth and capacity. The combination of these trends will continue to fuel growth for both servers and memory, painting a future outlook that is anything but bleak.